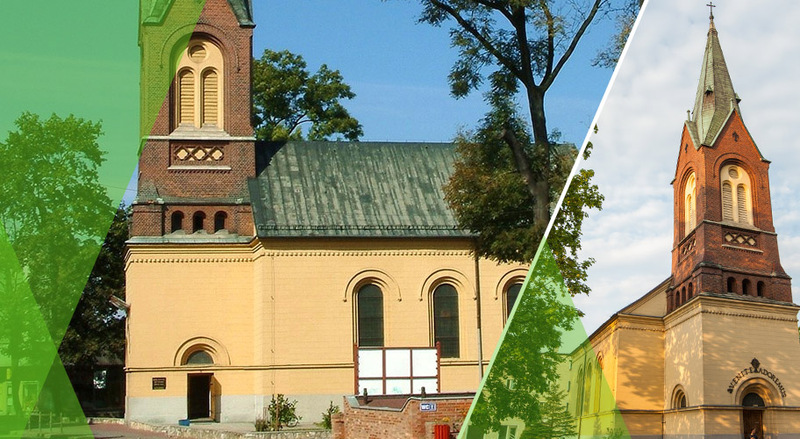 Evangelical Church was built in the years 1825 - 26 according to the plans of Ernest Samuel Friebl with some ideas of Krzysztof Worbs. Church tower was built in about 1888. The building has no specific style. It is built from brick and covered with plaster. There are semi-circle closed windows. Organ-loft is made from wood, supported by 4 pillars. The roof was covered with tiles. In 1982, the current St. Lawrence parish priest - prelate Jerzy Stellmann - took over the building for the Catholic community. Thanks to his efforts, the church was completely renovated and the roof covered with metal sheet in the years 1982 - 85. The church was consecrated as a Catholic temple in 1985. There are words in Latin: Venite - Adoremus, over the main entrance from Opolska str.